When we talk about Cadi Ayyad University, we are talking about a history, which involves a long period of hard work and great efforts. The eclectic student population is the best part of this University, since it comes from different places, with different ideas, goals, ambitions and beliefs. However, there is one special thing that ties us together – LOVE. We all love discovering, experiencing new things, meeting new people, and making new friends. Thanks to this University, we have learnt so many things, from writing short paragraph essays, to dealing with hard situations. We have laughed, cried, and shared a lot of feelings with each other inside this warm place. We feel that we belong to this university. The feeling that I am talking about, is not that simple. When I say I belong to this University, I mean I am a part of this University. When I say I belong to this University, I mean I have a role in this University. When I say belong to this University, I mean I love this University. I love it no matter what happened in it in the past, or the challenges I might face in the future. No matter how hard the journey, at the end of the road, you will realize that you have enjoyed and learnt so many things about yourself and life as well. that this amazing place deserves to be in a better condition, and we must do something to ameliorate it. We should give back, what we take from the university. The best thing that we can give this university, is our time and energy. Our time to create something unique, and our energy to study and work hard. This piece of my story, about my metamorphism at Cadi Ayyad University, is an experience that must be shared, regardless of how it is received by others. Perhaps, it will allow other students to appreciate our university and its historical context in shaping lives of those who have attended it, since 1978. 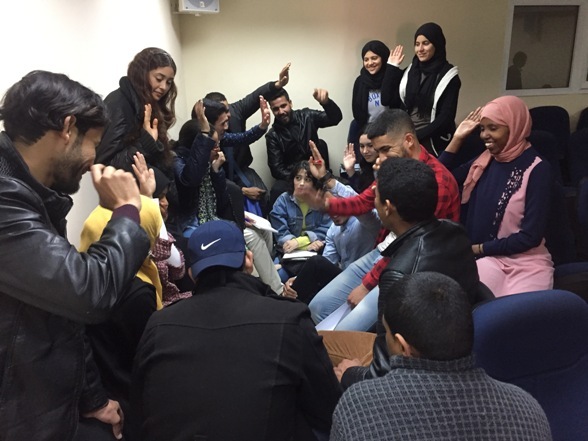 After university students Cadi Ayyad University evaluated their ideas for change (with the participatory facilitation support of the High Atlas Foundation), Fatime Zahra Emachloukh was inspired to write these thoughts about her student experience.